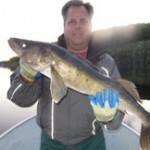 A Canadian Fly-In fishing vacation is a must for any angling enthusiast. 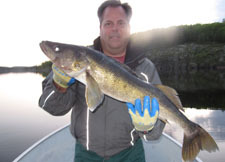 Cool fast flowing waterways provide excellent habitat for Canadian sport fish. 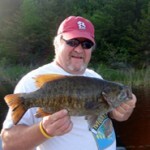 Trophy Walleye, Northern Pike, Smallmouth Bass, and Muskie are abundant in our waters. 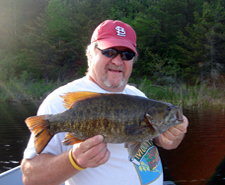 Fletcher Lake has history of producing trophy fish. You can expect fast and furious action all season long. Early season, we fish shallow well protected bays. We follow the fish a little deeper through the mid season. Eventually, deeper structured areas and mature weed beds in the later part of the season. Live bait is available for purchase however, a variety of artificial baits equally boast the same success rate. Detailed maps are provided for every angler. We review the latest fishing trends for every species with each party. We then help develop a strategy to ensure success. We practice conservation fishing. Trophy fish are measured a quick picture taken and quickly released. Measurements are then used to produce a replica graphite mount. All of our trophy fish are recorded and published in an annual report. Anglers are rewarded with a bragging cap and certificate. 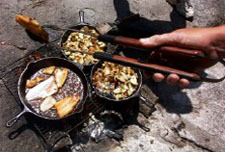 A limited number of smaller fish may be kept for a Canadian traditional shore lunch. Prepared for you lake side on an open fire or return to the main lodge where you can enjoy shore lunch in a relaxing setting. Of course, you will be able to keep your catch for shore lunch and transport back home per Ontario rules and regulations. 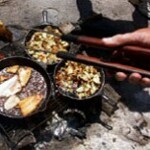 If you have never had a shore lunch, then you are truly missing out on a special experience. Fresh walleye literally minutes out of the water, filleted and prepared with vegetables and other kibbles, cooked in a frying pan over an open flame on the shore. Now you can enjoy a fresh fish dinner while sitting amid all the beauty that the Canadian forests have to offer! 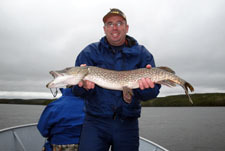 Fletcher Lake Lodge along with other outfitters in the area has teamed up with the Ontario Government to create the unique TROPHY WATERS program. This geographical area is entirely a conservation fishery. This conservation practice ensures many trophy fish in our lakes for you and future generations. 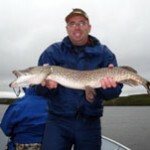 Since inception we have seen increased numbers of trophy fish caught and released back into our waters. This practice has been the driving force in setting us apart from many other regions. We are proud to offer fisherman this unique angling experience. The TROPHY WATERS area of Canada sets the bar at a higher level.